Habit: Chrysobalanus icaco grows as a shrub to 1.5 meters in height with brown bark. The 2-ranked leaves are arranged alternately, to 10 cm long, elliptic to ovate to obovate with an entire leaf margin and obtuse or acute leaf apex. Young stems and petioles are reddish brown. The leaves are glabrous and the young branches and the inflorescences typically lightly pubescent. The actinomorphic, complete, perfect flowers are arranged in axillary or terminal cymes with few flowers. 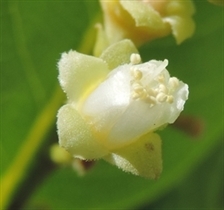 The calyx has 5 green, unfused sepals. The corolla has 4 or 5, white, unfused petals. There are 20 tomentose, white stamens that are fused to the middle of the corolla. The ovary is superior, with the style coming off of the ovary at its base, with a single locule and 1or 2 ovules but only 1 seed develops. The fruit is a drupe that is either white or purple at maturity depending on the variety. Habitat: Chrysobalanus icaco grows in Dry Broadleaf Evergreen Formation – shrublands/Dwarf Shrublands near in coastal areas as well as around Fresh Water and Saline wetlands. Distribution in Bahamas/Globally: Chrysobalanus icaco occurs throughout the Bahamian Archipelago as well as Florida, the entire Caribbean region and Mexico south to northern South America. Medicinal/Cultural/Economic usage: Chrysobalanus icaco is not used medicinally in the Bahamas. It is used in horticulture and the fruit is edible.